TLC Marketing Worldwide is the world leader in loyalty, incentive and reward campaigns, working across 15 markets with clients such as Coca Cola, Nestle, BMW and Citibank. TLC has many years of experience, running highly successful music led campaigns - one of the most notable being the European Beck’s beer promotion which gave away free music downloads with every bottle showing an “art label” (limited edition bottles designed by musicians). More recently in the UK, TLC and Universal Music were involved in a very popular free music campaign for No Fear energy drink offering a music download with every can. Universal Music Group's labels include A&M Records, Angel, Astralwerks, Blue Note Records, Capitol Christian Music Group, Capitol Records, Capitol Records Nashville, Caroline, Decca, Def Jam Recordings, Deutsche Grammophon, Disa, Emarcy, EMI Records Nashville, Fonovisa, Geffen Records, Harvest, Interscope Records, Island Records, Machete Music, Manhattan, MCA Nashville, Mercury Nashville, Mercury Records, Motown Records, Polydor Records, Republic Records, Universal Music Latino, Verve Music Group, Virgin Records, Virgin EMI Records, as well as a multitude of record labels owned or distributed by its record company subsidiaries around the world. The Universal Music Group owns the most extensive catalogue of music in the industry, which includes the last 100 years of the world's most popular artists and their recordings. 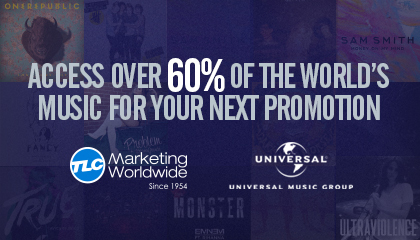 UMG's catalogue is marketed through two distinct divisions, Universal Music Enterprises (in the U.S.) and Universal Strategic Marketing (outside the U.S.). Universal Music Group also includes Global Digital Business, its new media and technologies division and Bravado, its merchandising company. Universal Music Group is a fully owned subsidiary of Vivendi.